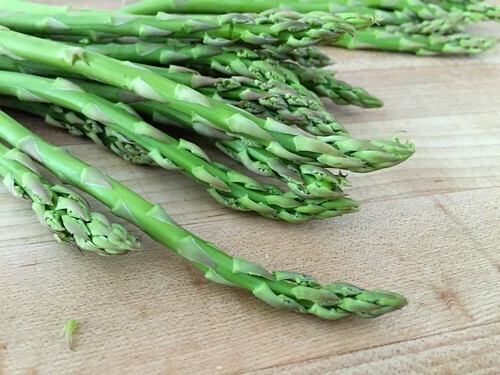 I always know when March has arrived, because I almost immediately find deals on asparagus at our local grocery stores… and since it can be pretty pricey, we usually don’t eat much of it in the fall or winter months. 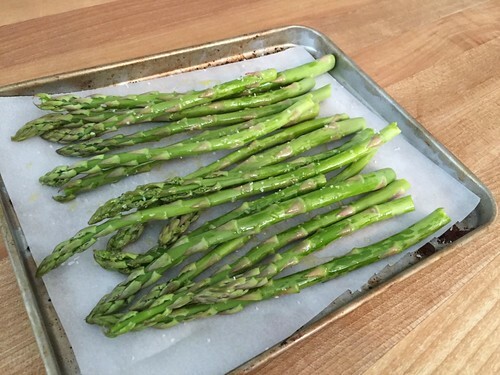 Dave doesn’t love asparagus as much as I do — and to be perfectly honest I never liked it until after I got married and started roasting it instead of steaming it like my parents do. 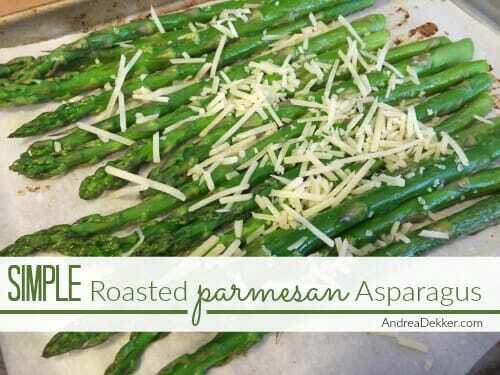 Now, roasted asparagus is one of my favorite veggies — especially with the addition of a little Parmesan cheese! 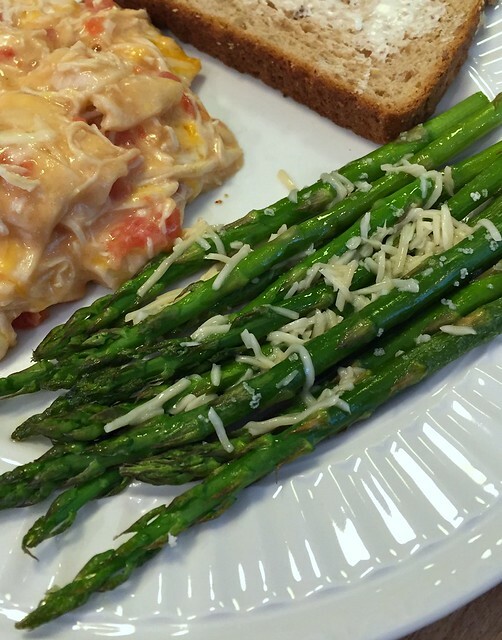 In my opinion, asparagus pairs nicely with almost any type of protein — beef, chicken, cheese, eggs, fish, etc. plus, it’s just SO easy to make! If you’re looking for a delicious way to add a little Spring flavor to your dinner table, I would highly recommend trying this recipe. 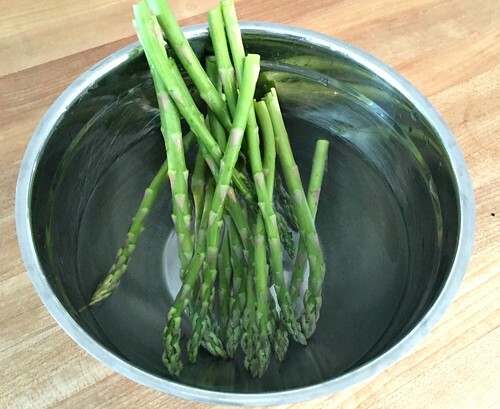 NOTE: I rinse my asparagus, with the heads down, under running water after trimming it. Then I let them soak (heads down again) in a bowl of water to make sure any sand is out of the heads. Obviously, there are no real “measurements” for this recipe — so don’t worry about messing anything up. And also, the cheese is not necessary… as long as the veggies are coated in oil and have a bit of salt, and as long as they don’t get totally charred, I’m positive they will taste yummy! 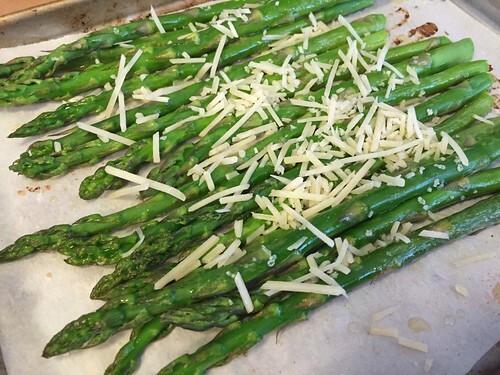 Dave and I both prefer our asparagus to be quite crunchy, so I usually only leave it in the oven for 6 minutes — and I always add the cheese because we all love cheese in our house! I think we’ve already eaten this simple side dish 4 times in the first 2 weeks of March — and I’m looking forward to eating it many more times before the growing season is over! Are you a fan of asparagus or not? I hated it when I was a kid due to improper washing. It was gritty! Now this California gal can’t wait till it shows up in the markets. I love it roasted! My only problem is the season is so short and my husband and I will only eat local produce and never anything from Peru or Mexico or anywhere else requiring shipping long distances. So when our local farms have it, we eat it many times a week. Did you know for some people it makes their urine smell funny? Love it too. Instead of regular salt, I am using garlic salt with parsley. Perfect. Thanks for the recipe Andrea. Can hardly wait to try it. Love asparagus! We LOVE asparagus. I make it almost the same way you do except with parsley sprinkled on it instead of parmesan. Parmesan would be yummy too! Yum!! Some time try it with bacon wrapped around it. I use half a slice of bacon per stalk, or some times bundle a few stalks and wrap with a whole slice of bacon. You can roast just like your directions. Makes the hubby smile a little more about having asparagus. everything is better with bacon… right? 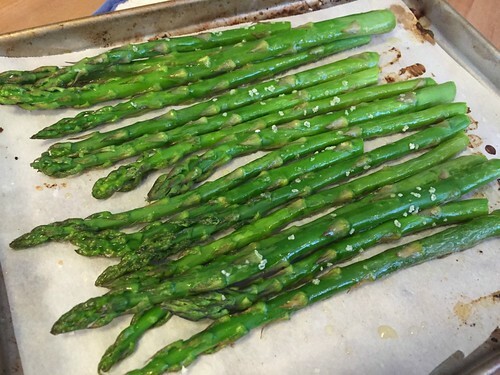 Roasted asparagus is one of our favorites too! We cook it just like you. Occasionally I will also sprinkle it with balsamic vinegar to give it a little zing. We’ll also put it in tinfoil and then on a the grill when we’re grilling meat in the summer. 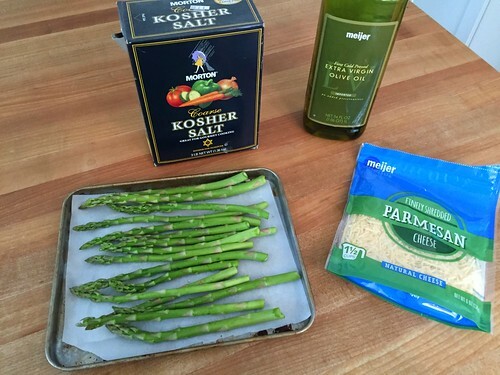 I do roasted beans with balsamic sometimes… I should try it for asparagus too! I have not had good luck with roasting broccoli, so I don’t do it anymore. What is your secret? Do you cover it with tinfoil? I love asparagus but only eat it in the spring. My Mother in law grows it in her garden (takes many years to establish asparagus) and we get it from her. Absolutely delicious. I will be trying your recipe this spring! I roast asparagus with olive oil, fresh garlic, salt and thin strips of red bell peppers. It is a family favorite. Yum! My parents always boiled asparagus and I wasn’t a big fan. I roast it with salt and pepper at 400 degrees until the tops get crispy and I love it! I’ll have to try it with Parmesan next time. Yay spring! 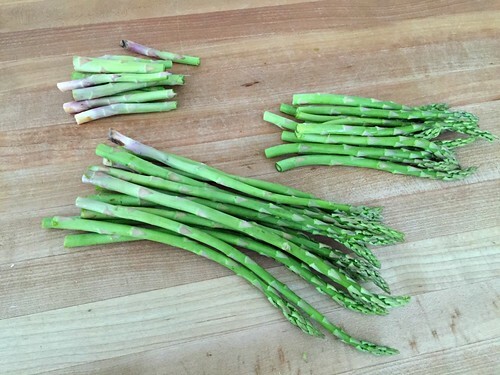 I haven’t had asparagus in years, but my dad and I used to pick wild asparagus on the side of the road at the “secret spot”. Thanks for conjuring up some good memories and for the simple recipe.